You are probably wondering how photosynthesis can have anything to do with lawn care. It can actually shed some light on how and why plants grow and will simplify your approach to lawn care. Photosynthesis is the process by which plants produce the food they need for daily function. The food they create is called carbohydrates. In fact, the breads and cereals we eat are packed with carbohydrates produced in this way. Plants produce their food by absorbing carbon dioxide from the air and fixing it at a binding site within the plant. It is truly amazing how grasses can take gases from the air and produce food in this way. Chlorophyll, the substance that gives grass its green color, is also part of the photosynthesis process. Ever Wondered Why Grass Looks Green? We see grass as green because chlorophyll absorbs red and blue wavelengths, while reflecting a green color. When grass absorbs the light energy, the chlorophyll molecule goes into a high energy state, providing chemical energy for plant metabolism. Although both cool and warm season grasses conduct photosynthesis, it is how they do it that makes them different. You won’t think about your lawn in the same way. What does photosynthesis have to do with lawn care? We are all familiar with the old saying, “We are what we eat.” But what can we say about a plant that makes it own food? Grass can’t move around to find better soil, sun or water, so they adjust to their conditions to the degree they are able. However, in the life of your grass, it is more than just a group of blades and roots. All grass types are bound by their ability to continue the photosynthetic process or it will weaken and die. The carbohydrates that are produced is the energy source for the plants. Some carbohydrates are used right away, but what is not used is stored away within the plant to be used when it needs it. These reserves are used during times of stress and when carbohydrate production is low, such as when the grass is mowed too low. Carbohydrates produced in the fall are used to break dormancy in spring. Warm season grasses and cool season grasses both perform photosynthesis. What makes them different is their photosynthetic system. Each grass type has a different system and that affects their growth. The cool season grasses begin the photosynthetic process with a three-carbon compound, while the warm season grasses begin with a four-carbon compound. Scientists call these two grass groups C-3 and C-4 after their respective carbon compounds. As you know, cool season or C-3 grasses, including tall fescue, Kentucky bluegrass, ryegrass, bentgrass, and others, become active in early spring. A growth spurt begins in spring and ends in late spring or early summer. When grass growth slows for summer, it generally won’t pick up again until the fall when temperatures drop, but even then, growth will be less than in the spring. This is important: As air temperatures rise in mid-summer, the C-3 grasses struggle to produce enough carbohydrates, so growth and leaf production slows down and levels out. The three-carbon compound of C-3 grasses is not as efficient at fixing carbon dioxide as the C-4 warm season grasses are during high heat periods. During the summer, carbohydrate production in C-3 grasses can drop off by as much as 50%. This explains the tendency for cool season grasses to go through summer dormancy. Grass stress levels are higher in summer and it takes more energy just to perform its daily functions. To conserve energy in summer, especially when little water is received, C-3 grass will close the stomata, preventing gas and water vapor from escaping. Any unused nutrients are transferred back to the roots and dormancy follows. Water is necessary for plant function, so to keep C-3 grasses growing, it needs to be watered in summer. Assuming that soil nutrients are sufficient, the addition of fertilizer will not help cool season grass produce more carbohydrates. The problem is with the three-carbon compound and not with fertilizer. Yes, fertilizer may substantially increase growth, if there is sufficient water, but it will be at the expense of plant health. 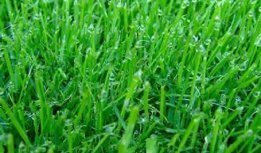 During summer months when C-3 grasses are not growing, we don’t want to try to make it grow or it could injure or even kill the grass. This is important to know. To explain further, a mistake some people make is to use a high nitrogen fertilizer on cool season grass during the summer. High nitrogen applications will force the grass to grow when it doesn’t have the energy to support it. It can weaken the plant by forcing it to use up its reserve of carbohydrates. In addition, over fertilizing contributes to unnecessary growth that can thin the outer layer of the plant and making it more susceptible to disease. The goal in summer is to feed the grass without causing unnecessary growth. The use of organic and organic/synthetic blend fertilizers are extremely useful, especially during summer months. See "Fertilization" and "Organics" section. With cool season grasses, avoid low mowing, especially in the summer. A setting of three or four inches all year is good, especially for C-3 grasses. Most people mow too low, not realizing the importance of blade length. If you are not used to mowing at your mowers highest setting, you can easily get used to it and your grass will love it. You will ensure that there is always enough green tissue available for photosynthesis. When mowing, do not remove more than 1/3 of the blade length at a time. It is not good for the grass and will use some stored energy to replace the grass blade. Water deeply and less frequently. Light watering only encourages shallow rooting and will lead to faster dormancy during stress periods. Fertilize when the grass is actively growing. Do not over fertilize. Warm season grasses, including bermudagrass, Zoysiagrass, St. Augustinggrass, Buffalo grass, and others, are well suited for the hot summer months when the process of photosynthesis is in high gear. The four-carbon compound is much more efficient at fixing carbon dioxide in hot weather. In addition, the roots of C-4 grasses are designed to reach twice as deep as C-3 roots. It is believed that the deeper root system helps contribute to its hardiness. Fertilizer doesn't produce carbohydrates, but rather it supplies the needed nutrients for plant functions so the process of photosynthesis can continue as needed. As a general rule, warm season grasses only need fertilizer when they are actively growing. When the grass turns brown and goes dormant in winter, there is no activity in the plant and the fertilizer will be wasted or used by cool weather weeds. The amount of nitrogen needed for warm season grasses vary considerably, so review the warm season grasses pages for a better understanding of nutrient needs. Avoid mowing lower than what is healthy for your grass. Although most warm season grasses can be mowed at lower heights than cool season grasses, some types will benefit from more available tissue. If you want to lower your mowing height, do it gradually over several weeks. This will give the grass time to produce more tillers (grass blades) to make up for the lower height. Water deeply when needed if there is not sufficient rain. This will depend also on soil type. Sandy soil does not hold water as well as loamy soil. Fertilize regularly while grass is growing, throughout the summer to replace soil nutrients and to promote growth and color. The nutrient requirements vary greatly depending on grass type. In today's world, the environmental concerns of pesticide and fertilizer use is a growing concern. It seems the road is paved with misinformation. Fortunately, the majority of problems are not caused by homeowners. Click here for help and safety information on this topic. Understanding how plants grow and spread will help you in managing your grass. It will help you know in advance whether your grass will be a problem to you and your landscape or a benefit. Cool season grasses are generally found in the northern U.S. and in the transition zone. Some types are also used in the southern U.S. Find out what they are and management techniques. Warm season grass are the primary grass types in the southern U.S. Many types can grow as far north as Canada. Find how to if one of these types can be grown where you live.